As our departure date draws ever nearer we are proud to display a magnificent map created by Louise Limb. It embraces all the exciting aspects of our planned trip. 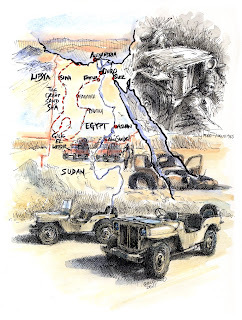 The history, the adventure, desert themes and those all important LRDG wrecks. More soon on my visit to Murzuq and some new material relating to the famous LRDG raid in 1941. Think I'll order eight Tee-shirts with this map on!